We’ve already seen that Pinterest drives more traffic than Twitter, as well as more traffic than Google+, YouTube and LinkedIn combined, but one thing we haven’t heard much about is where all that traffic is actually going. 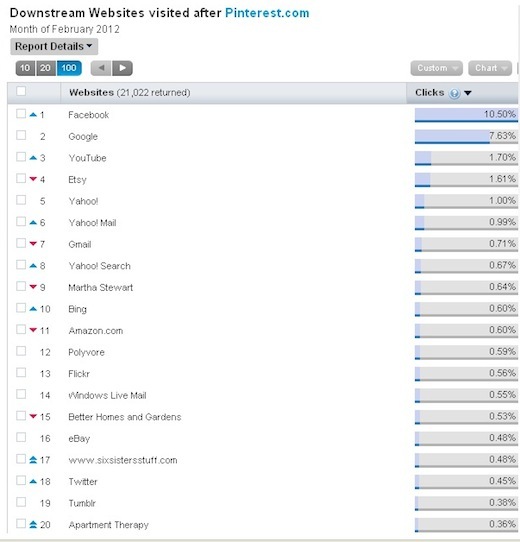 Experian Hitwise revealed the top 20 sites that are benefitting from Pinterest’s traffic avalanche, and it’s interesting to find that snagging the number one spot is yet another social networking behemoth – Facebook. A lot of these sites don’t come as a surprise, especially if you look at the top sources for content on Pinterest. Google is in the number one position, followed closely by Etsy and Amazon. What does come as a surprise however, is that the top sources are not necessarily the top beneficiaries of that traffic. For example, Facebook is nowhere to be seen in the top 10 sources (it slips in at number 13) and yet shoots right to the top of Experian’s list, with quite a significant margin on its peers. Facebook benefits from 10.5% of Pinterest’s referral traffic, while Google follows at 7.63%. The rest of the rest of the sites trail far behind, with YouTube only accounting for 1.7% of downstream traffic, despite being in third place. As expected, quite a few sites make an appearance on both lists – Facebook, Etsy, Google, YouTube, Marth Stewart, Tumblr, Flickr, Amazon, and eBay – just to name a few. With Google, it’s hard to guess which of its products are gaining the most traffic, but we’re guessing it’s a combination of Google’s Image Search, Google+ and possibly to a much lesser extent, Picasa web albums. 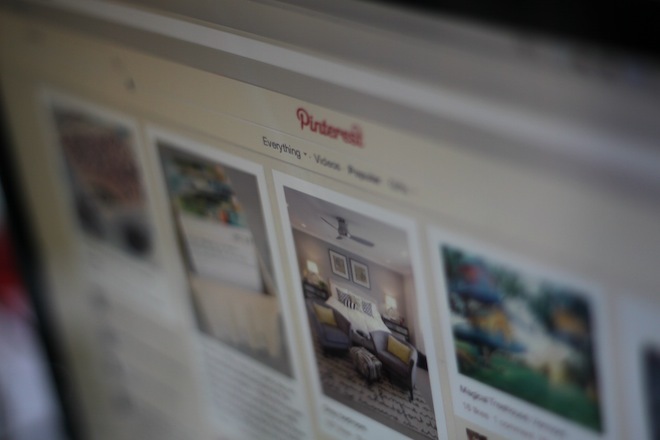 Seeing exactly where Pinterest users are heading gives some insight into how the site is being used. It’s definitely interesting to see that a lot of Pinterest users are plugged into sharing via email. With everyone entirely obsessed with social sharing, Yahoo Mail, Gmail and Windows Live Mail all make a significant appearance on the list. Surprisingly, Yahoo Mail does come right ahead of Gmail, albeit beating it only by 0.28%. The top traffic recipients reinforces conclusions that have been made about the average Pinterest user’s interests – divided primarily between e-commerce sites, recipe and home decor sites, and social networks. The site itself has seen record growth, having just cracked the top 30 sites for the most pageviews in the US, so it’s definitely interesting to get a glimpse of where some of that traffic is going once it leaves Pinterest.